In October 1907, Henry married Emma Elizabeth Spowage from Lenton, Notts and became the step-father of Emma's daughter Mabel, then aged about 8, The couple made their home at 31 Station Road, Beeston5 where two daughters were born to them - Lily May in 1912 and Edna in 1913. Henry found work at the local telephone works as a labourer whilst continuing his involvement with the Notts & Derby Militia. At the outbreak of war, in August 1914, Henry re-enlisted as a Private6 in the Sherwood Foresters (Notts & Derby Regiment) and was posted to the 1st Battalion when they returned from India, arriving in France in March 1915. However, his time in France was to be shortlived as he was wounded on May 9th 1915 at Ypres and, having recovered from his wounds, on 1 July 1915 he was struck down by a "mysterious illness" and admitted to Havre Hospital. A week later he was transferred to England on the Carisbrooke Castle and admitted to the Royal Victoria Hospital at Netley, Hampshire where he died, on 26 July 1915. The cause of death was recorded as acure nephritis7. 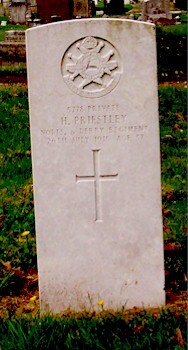 Private Priestley was given a full Military Funeral at Wollaton Road Cemetery, Beeston. His memorial is one of 46 in the cemetery, from all wars, which are maintained by the Commonwealth War Graves Commission. At the time of his death his brother Fred was serving in France, and, as the local paper records, he was sadly missed by his two sisters Harriett and Lizzie8. 1His baptism was at Beeston Parish Church on 19th April 1882 (together with a younger brother). The register records his middle name as "Edmund" (which was the name of his maternal grandfather) but he gave a middle name of "Henry" when he married. Despite this Church of England beginning, he declared his religion as "Wesleyan" when he joined the Army in 1898. 3As well as Henry Edward, these were Harriet (b. c1877), Frederick (b. 1880), Sarah Ann (b. 1883), Thomas William (b. 1885, died 1888) and John (b. c1887). Elizabeth, born in about 1874 and raised with the family was probably their half-sister. 4Fairly comprehensive Service Records for Henry have survived. Whilst these are included in the World Ward 1 archives, they include records of his whole Army career from 1898. For his service in South Africa he was awarded the Queens South Africa Medal with Cape Colony, Orange Free State and Transvaal clasps. 51911 Census Piece 1223 RD429 SD3 ED6 Sched 72 - 31 Station Road, Beeston, Notts. 7In his Army medical records, his condition was described as acute nephritis (i.e. kidney failure) with uraemic poisoning and dropsy. He also had bronchitis. Given this reasonable clear diagnosis, it is unclear why it was considered as "mysterious" at the time. His army records make no mention of the incident on May 9th or treatment for wounds although he did receive treatment for dental problems on 19th May. 8Henry's sister Harriett had married Henry Brown in 1903. His half-sister Elizabeth ("Lizzie") had married William Dear in 1897. His brother Frederick had married Florence Beatrice Tebbutt in 1907; after the war he lived at Gladstone Street, Beeston. Brother John (known as Jack) married Lily Lomas at the end of 1918 and set up home at 44 Victory Road, Beeston. His sister Sarah Ann married Thomas Aldred in 1906. 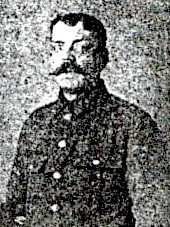 Henry's wife remarried in 1916 to William Stubbs and is recorded as living at 68 Station Road, Beeston in the CWGC records.